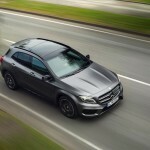 After many rumors and a lot of teasing, Mercedes-Benz has finally released the details and pictures of the new 2015 Mercedes-Benz GLA-Class, which will make its public world debut at the 2013 Frankfurt Motor Show next month. 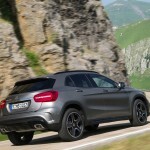 The new Mercedes-Benz GLA-Class is the brand’s first compact SUV ever and measures 173.9-inches in length 71-inches in width, and 58.8 inches in height. 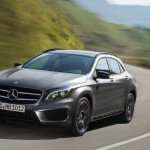 The model, which is based on the new CLA-Class, is also the first Mercedes-Benz SUV to be available with the new-generation permanent all-wheel drive system 4MATIC, with fully variable torque distribution. 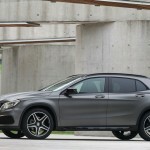 The 2015 Mercedes-Benz GLA-Class will go on sale in the United States as a GLA250 with all-wheel-drive, the front-wheel-drive GLA250 will arrive in early 2015. 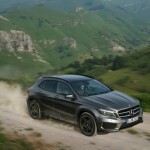 Power will come from a 2.0 liter 4-cylinder turbo engine making 208-hp with a maximum torque of 258 lb-ft.
Prices will be announced closer to launch date. 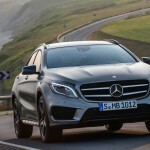 Sales in the U.S. will start in fall of 2014. 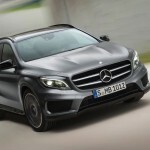 When the 2014 Mercedes-Benz GLA goes on sale next year, it will compete with the likes of the BMW X1 and the Audi Q3 (the Audi will come to the U.S. some time next year as well). The BMW X1 is available as an xDrive28i which produces 240-hp and an xDrive35i which produces 300-hp. 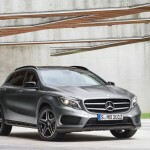 Imagine you’re in the market for a new compact luxury SUV – which one would you consider parking in your driveway?